Sustainable actions become more and more important in all areas of life. Where does Knauf see its special responsibility? "Firstly, we see an inseparable link between economic success and the responsibility for the environment and society. This means sustainability is worth it. This becomes apparent for example in energy efficiency and in climate protection, where we make a great effort. We support energy-focused refurbishment of buildings with our products and systems. It supports saving energy and lowering CO2 emissions. But we have also taken action in our own company: we have refurbished the administrative buildings, introduced a certified energy management system, and we use green electricity and energy-efficient combined heat and power plants. Furthermore, we support resource-efficient production by using natural gypsum that is extracted in an environmentally friendly way, synthetic gypsum from industrial flue gas desulfurisation plants as well as recycled gypsum as a secondary raw material." What do your clients and partners think? Do you require more sustainability for products and systems? "The trend clearly goes in the direction of sustainable construction with the corresponding certifications according to recognised standards. Consequently, our partners, professional tradesmen, building material wholesalers, architects and planners also have a higher demand for sustainable products and systems. They are reacting to the high demand from residential building developers, hospitals, schools or public administration. We can jointly gain interesting target groups that are urgently looking for convincing solutions for the sustainable use of buildings. And energy efficiency is only one component. The satisfaction/fulfilment of socially oriented requirements, such as living comfort, hygiene, indoor climate, sound insulation and fire protection, are equally important. We must not neglect flexibility in the use of spaces, which can be achieved very simply and economically with our drylining solutions." What roles do the employees play when talking about sustainability, where are their ideas required? "I am happy that our employees actively participate to make Knauf an even more sustainable company. A fantastic initiative was for example the First Sustainability Day of Knauf, which we held last year in Iphofen. Our employees showed enthusiasm in implementing their own ideas about environmentally friendly mobility, healthy eating and physical activity. 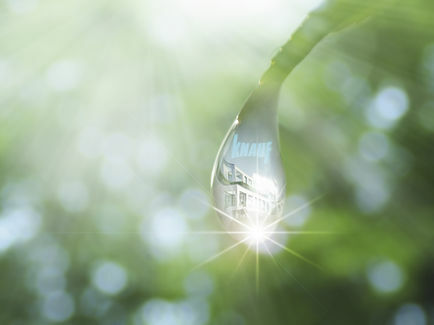 This shows that sustainability has become an important issue at Knauf. In our day-to-day work we also ask for and need suggestions for improvement. Saving energy is one of the topics where everybody can contribute. We will continue supporting this type of commitment, in particular with targeted training and further education." Can sustainability in a family business be implemented differently from group structures? "Certainly differently, maybe even better. Family businesses like Knauf think and act in the long-term, they are flexible, have short decision-making procedures, a flat hierarchy and trust their staff to take on responsibilities at an early stage. Our success is also based on the orientation towards fixed values and the corporate culture of working together. This can be noticed everywhere, even though we have developed from a family business to a corporate family with many international sites and market activities. I will ensure that these Knauf values will remain the guidelines for our actions in the future and will be alive in all areas of our company." The first sustainability report is a good performance balance of the company. What goals does Knauf have for the future? "Our principle is: There is nothing that cannot be improved. It is important to us to work more and more closely with our clients, to be able to take advantage of market opportunities by means of sustainable products and systems. We will continue to drive our innovations further and take a strong stand for even better framework conditions for the refurbishment of buildings. We also want to grow as an employer and strengthen employee satisfaction; this means, we want to improve family friendliness, offers for further training and health promotion. With this, we will be able to inspire young people - and in the future more women - to work for Knauf. We want to give them more responsibility and promote women in executive positions. We also want to enhance our commitment to the environment: We will further reduce emissions, save energy and leave nature after gypsum extraction in a better condition than before we found it. We also plan to communicate our activities in the area of sustainability more transparently not only in Germany, but we also want to incorporate the initiatives of all international sites of the Knauf Group."